During working days, there were a couple of strays that I had been feeding. 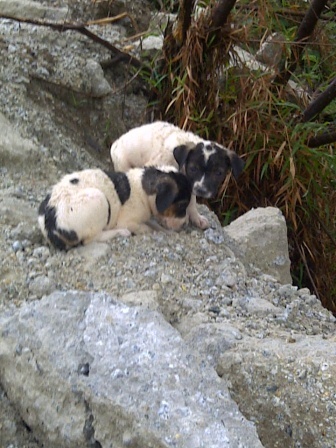 Before this rainy season, it was the hot season and one day, I chanced upon a very hungry, thirsty female stray dog who just delivered a set of puppies. I knew as her babies must be sucking milk from her skinny and malnourished body. Feeling sorry for her, I started getting food and dropping by each day to feed her. Furthermore that time our office was able to provide me some surplus but unwanted food. I tend to drop by and put food at a fixed area after my working time. The female dog grew to expect my ‘feeding schedule’. There were others who also took pity on them as well- as I saw someone placed a bowl of water and some leftover chicken (must be from the kind chicken rice seller). 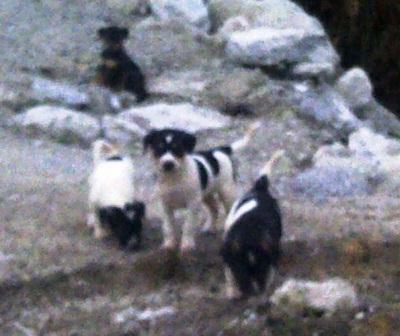 A male dog (who I presume must be the father) and later I sighted her 4 cute little pups playing happily one evening. Last weekend was a long holiday for many Malaysians. As Hari Raya fell on a Sunday, we got Monday and Tuesday off as well. So that makes it 4 days in total. As I tend to pass by the place when working, the 4 days off from work meant that I did not go and feed them. Almost each evening, it had been raining- the scroching hot sun had been replaced by dark clouds and windy rainy evenings. I wondered how the female dog and her pups were faring. Did anyone went to feed them? My heart felt a tugging and I told myself perhaps I should go and take a look. It’s likely no one fed them as many city dwellers have left town to go back to their respective hometowns as it is such a long break. By yesterday Monday (after 3 days) evening after it rained, I decided I should go there and take a look. So I filled up some dog food, jumped into my car and drove them. Far from being playful- these two pups initially huddled together under the tree – wet and obviously caught in the rain as there was no where else- no cars or roof for them to seek a shade from the rain. They were shivering and was too weak to run away. After Friday night (the last time I dropped food)… it was a rainy Saturday, Sunday and now Monday… poor things. I am glad I did not get lazy and follow my heart’s tuggings and went over there. 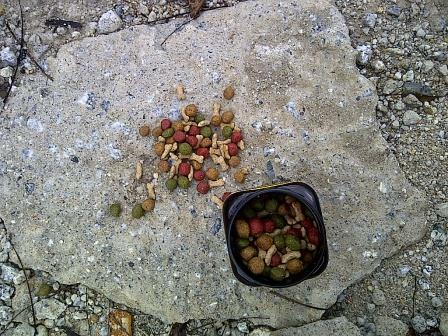 So I placed the dog food on a stone (I was thinking to put on a plastic or paper but worried the strong wind would blow the food away). From a distance, the male dog looked at me but he was used to seeing me putting the food. As I got into my car and drove off, I could see from my rear view mirror that he went towards the food. I am touched by this family of stray because they were not fussy. Once someone gave me a few packs of unfinished vegetarian rice- which I placed there. The next morning went I went there, the rice box was finished clean- not even a single grain of rice could be seen. They must be so hungry. Sometimes you may feel “oh, what’s the use?”- you may be an animal lover but you and I know full well that we cannot feed all the hungry in the world. When I first went to Thailand, I was saddened by the stray dogs that I’ve seen there. They were so thin, weak and hungry- and they looked nothing more than diseased skin wrapping bones. Most of them had fleas, injuries, and some open wounds. Thailand is a strong Buddhist country and hence they would not round up strays and kill them, like what they do in Malaysia. The locals have gotten used to them and they co-exist in a harmonious manner. Not like here where some people who find them a nuisance would report them to the municipal who would then call the dog catchers. Even some of my Muslim friends are very appaled at how cruel and inhumane that the dog catchers treated these poor animals that they post it up in Facebook. Don’t be dismayed. Don’t feel deterred. Make a difference- one live at a time. One stray at a time. You give them food today but may not be able to give them food tomorrow. It’s okay- at least for one night, they could sleep with some warmth in their bodies. For tonight, they have no hunger. 1. Buy a packet of cat/dog food. Most of them are expensive but sometimes you can find it at a bargain. I had bought a huge sack from one of the Tesco budget corner (they marked down the price). These are the best as it can be kept for long time and carried around easily. 2. Find an airtight plastic container- something small enough for you to put into your daily bag or handbag. I used a 500ml Manuka honey plastic container. 3. Fill it up with dog/ cat food. Place in your bag. As you commute to work, if you noticed there are strays walking around, drop your food near a dry surface- not on the sand or dirt land where the rain can cause the food to soak in dirt. Also not right in front of prying public eyes, least dog catches got hint of it and come to trap them. 4. You can come back the next day to see if the food is missing. If it is, then some hungry stray would have benefited. Usually if you go there around the same time each day, they may even learn to expect your presence. Alternatively if your department is having a feast and lots of leftover food are waiting to be thrown off and you know a certain area have stray dogs or cats, you can fill up some of the leftovers- especially chicken (or the bones) in a container and dropped it off on your way back. Strays had been so used to a life of hardship and hunger – and at complete mercy of the elements. They live in constant fear of being hunted and most have had experienced being hit or had something thrown at them at the attempt to chase them off. So they had grew to expect nothing and hunt around, hopeful to find some remains of food, even rotted ones to eat to prevent them of dying of hunger. When you feed them and get to see them eat, they have gratitude in their eyes- even though they are merely animals. The female dog whom I had been feeding- as I placed the food and walked a distance back to my car, she would look at me for a while- a look that without words spoke of her gratitude, before eating the food. When I first decided to do this, I had thought it may be a hassle but instead, I had find it something to look forward to- it had become a habit. Perhaps one day the dog catcher may get to her, or some unfortunate harm may came her way. I could not keep her because I’ve had enough dogs at home and the law only permits a limited number of dogs that one can keep. But so long as she is alive, and I am working not far from the vicinity, I would want to put food in the usual spot- and on most days, she or the male fella would be there waiting for me. Even though we cannot remove the strays’ suffering, at least we can doour part from having them starved to death. So, make a difference, feed a stray today.